Do you know that running 1 PC for multiple users is the right way to go to start benefit from a higher level of productivity and great cost savings? In fact, a multi user PC solution makes it possible for businesses to cut down their investments in computing equipment considerably. IBIK is ready to provide your company with innovative ASTER multi monitor software designed specifically for inexpensive computerization of office workplaces. As ASTER multi user PC solution has the ability to expand 1 standard PC system into several additional workplaces without buying expensive computer hardware, it is considered to be a rather beneficial option for office computerization. While the price of our multi monitor software is low compared to the cost of a computer system unit, it allows to use 1 PC for multiple users with one set of software tools and save on maintenance dramatically. With our multi user PC solution you can set up from 2 up to 10 computer workplaces on the basis of just one system unit. 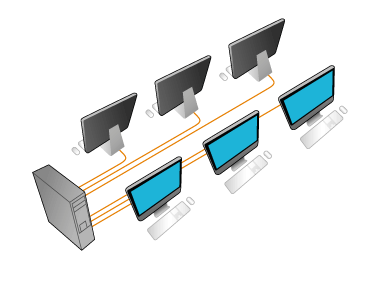 Moreover, as ASTER multi monitor software allows sharing 1 PC for multiple users along with computer resources at the same time, each user can work independently without hurting the functionality of other users. Undoubtedly, if compared to using separate computer stations, ASTER multi monitor software ensures a better value for money. While being an affordable and highly efficient multi user PC solution, ASTER is recommended for computerization of office units, banks and educational institutions as well as for providing various conferences, seminars and trade shows with Internet-connected workstations.